Disabled people around the world are often defined in terms of their impairments or conditions, with little thought to intersections with race and ethnicity or other socially constructed identities and experiences Using intersectionality, this chapter asks: Whose bodies matter? Who do states protect? How do disabled people contribute? and Of what benefit are human rights in an intersectional approach? 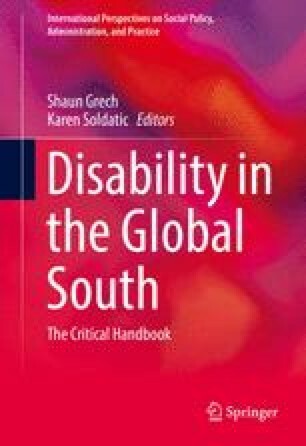 We also ask in what ways do racialised relations of power intersect with disability to construct and reinforce global and local inequalities? Through this we expose critical assumptions about and complexities in exploring race, ethnicity and disabilities in the global South and between the global South and North. Stienstra, D. (2015). Northern crises: Women’s relationships and resistances to resource extractions. International Feminist Journal of Politics, 17(4), 630–651 doi: 10.1080/14616742.2015.1060695.